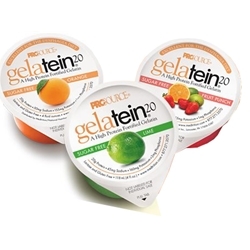 Prosource™ Gelatein 20 gives you 20 grams of high quality hydrolyzed protein in just a 4 oz serving. 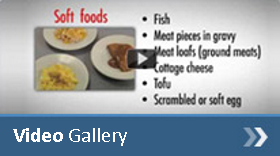 Appropriate Diets: Bariatric. Clear Liquid. Dysphagia. Renal. Available in Orange, Fruit Punch and Lime flavors. Orange Flavor: Water, protein from collagen hydrolysate and whey isolate, malic acid, carrageenan and carob bean gum, natural flavors, potassium citrate, L-tryptophan, Sucralose, potassium sorbate, sodium benzoate, Acesulfame potassium, Yellow 6. Contains milk. Fruit Punch Flavor: Water, protein from collagen hydrolysate and whey isolate, malic acid, carrageenan and carob bean gum, natural flavors, potassium citrate, L-tryptophan, Sucralose, potassium sorbate, sodium benzoate, Acesulfame potassium, Red 40. Contains milk. Lime Flavor: Purified water, protein from collagen hydrolysate and whey isolate, malic acid, carrageenan and locust bean gum, natural flavors, potassium citrate, L-tryptophan, Sucralose, potassium sorbate and sodium benzoate (preservatives), Acesulfame potassium, Yellow 5, and Blue 1. Contains milk. Grape Flavor: water, protein (from collagen hydrolyzate and whey isolate), malic acid, carrageenan and locust bean gum, natural flavors, potassium citrate, l-tryptophan, sucralose, acesulfame potassium, potassium sorbate and sodium benzoate (preservatives), Red 40 and Blue 2. Contains milk.